Click the link below to go to the Chili's Facebook. 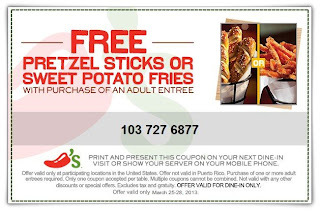 Once on Chili's Facebook "Like" their page and print the coupon. Get Free Pretzel Sticks or Sweet Potato Fries with purchase of Adult entree. Offer valid March 25-28th, 2013.